Human cognition affords our species an excellent toolbox for solving problems. Many nonhuman animal species appear to share with humans some of these tools. However, human cognition also is fallible. Susceptibility to perceptual illusions, misrepresentation of probabilities, cognitive biases, faulty memory, and heuristics all present sources of error from which behavior is suboptimal in the pursuit of goals. Some nonhuman species share these perceptual and cognitive biases with humans. Examples of this are described for nonhuman primates, ranging from perceptual illusions to humanlike failures on games of probability such as the Monty Hall Problem. Sometimes the performances of nonhuman primates mirror those of humans, but there are exceptions. Given that other species do experience things erroneously and make errors in judgment, it is an exciting question of whether they also might generate any strategies to offset their fallibility. Two examples to suggest that they do are provided from research with chimpanzees. One is of strategic self-distraction in the face of tempting rewards in a delay of gratification task. The other is of information-seeking behaviors in different contexts where chimpanzees have different types of information. This research, and that of many other groups, shows the value of examining perceptual and cognitive errors across species, and how different individuals and different species may be equipped psychologically to deal with the possibility of these errors occurring. Author Note: Michael J. Beran, Department of Psychology and Language Research Center, Georgia State University, Atlanta, GA 30302. Correspondence concerning this article should be addressed to Michael J. Beran at mjberan@yahoo.com. Acknowledgments: Much of what is presented in this article is adapted from the author’s 2014 Presidential Address entitled “To Err Is (Not Only) Human: Fallibility (and Success) in Comparative Approaches to Cognition,” which was presented at the 106th annual meeting of the Southern Society for Philosophy and Psychology. The various research projects discussed in this article were supported by funding from the National Institute of Child Health and Human Development (grants RO1HD-061455, PO1HD-060563, and PO1HD-38051), the National Science Foundation (grants BCS – 0924811 and BCS – 0956993), and the College of Arts and Sciences at Georgia State University. I offer my thanks and appreciation to the people at the Language Research Center who make this research possible, including the staff members who take excellent care of the animals. I offer special thanks to Ted Evans, Audrey Parrish, Bonnie Perdue, and Christian Agrillo, who all played central roles in these research projects, and more often than not were the driving force behind those projects. This article is dedicated to chimpanzee Mercury, who sometimes was the “poster child” for studies of errors in decision making but who also taught us a lot about chimpanzee cognition, and to chimpanzee Lana, who was the first to talk to us using lexigrams, which she continued to do for nearly 45 years. These chimpanzees died in 2016 and will be missed, both for their contributions to science and for their willingness to let us learn from them. The 20th century saw a shift in how humans thought about nonhuman animals (hereafter, animals), their behavior, and the cognitive processes that might underlie their behavior. Comparative cognition emerged as a strong discipline in the second half of the century, largely as a result of the broader cognitive revolution in human psychology, continued developments in ethology, and new opportunities to study a diverse range of species (Shettleworth, 2010). Earlier comparative psychologists certainly took an interest in aspects of cognition (see Dewsbury, 1984, 2000, 2013), but researchers in the second half of the century provided new approaches to understanding animal minds. Initially these approaches focused largely on traditional aspects of human cognitive psychology, including memory, perceptual capacities, and learning phenomenon (e.g., Honig & Fetterman, 1992; Hulse, Fowler, & Honig, 1978; Roitblat, Bever, & Terrace, 1984), as they might reflect the use of mental representations and other information-processing approaches for interacting with the world. Later, research increasingly focused on questions that covered nearly every topic found in a human cognitive psychology textbook, and even questions that were not typically discussed in such sources (e.g., theory of mind, deception, mind reading, cooperative decision making, metacognition, mental time travel, and others; e.g., Beran, Brandl, Perner, & Proust, 2012; Byrne & Whiten, 1988; Dugatkin, 1997; Maestripieri, 2003; Tomasello & Call, 1997; Vonk & Shackelford, 2012; Zentall & Wasserman, 2012). Much of the research that occurred toward the end of the 20th century and into this century was dedicated to demonstrations of what animals could show us about the proficiency and effectiveness of their cognitive abilities. Often, the research strategy was to demonstrate some new capacity in a given species and to relate such capacities to the evolution of human cognition. This has been a wildly successful approach. We now know far more about the minds of many species than we did 20, 50, and certainly 100 years ago, and the field of animal cognition (or, if you prefer, comparative cognition, comparative cognitive science, or cognitive ethology) continues to generate new and exciting evidence for the cognitive capacities of animals. In many instances, changes in methodological approaches have provided us with more reliable estimates about the cognitive capacities of nonhuman species. To give just one example, closely related to my own research interests, one can look at research into numerical cognition. Although a favorite topic of early comparative psychologists (see Boysen & Capaldi, 1993), this area of research suffered because of methodological shortcomings, overinterpretation of data, and a general failure to interpret animal behavior cautiously, even in cases in which the behaviors seemed extraordinary (Davis & Perusse, 1988; Pfungst, 1911). The so-called Clever Hans effects seen in some of these cases led to a backlash against research in this area, and it took many decades to overcome this (Candland, 1995). However, new approaches and a more conservative interpretation of the data they generated has led to a more reliable understanding of the numerical abilities of nonhuman animals and how they compare to those of humans (e.g., Cohen Kadosh & Dowker, 2015; Geary, Berch, & Mann Koepke, 2015). We now know that formal counting in animals and other exact calculation capacities are unlikely. Instead, we have learned that animals exhibit a foundational but approximate sense of numerosity and that this is true also for humans (e.g., Brannon & Roitman, 2003; Cantlon & Brannon, 2006; Huntley-Fenner & Cannon, 2000). Thus, the “hunt” shifted from being about “counting animals” to being about basic, phylogenetically widespread mechanisms that might support a formal system of mathematics in our species. From that new perspective, we then learned much about the psychological (e.g., Gallistel & Gelman, 2000) and neurobiological (e.g., Dehaene, Dehaene-Lambertz, & Cohen, 1998; Nieder & Dehaene, 2009) mechanisms of quantitative cognition. I began working in this field pursuing the question of “Can animals count?” but ended up instead asking, “How do animals process quantitative information?” largely because of the restrictions that were discovered in animals’ quantitative cognition. For example, animals represent quantities imperfectly, with more variable representations emerging as a function of increasingly larger true array sizes (Brannon & Roitman, 2003; Cantlon, Platt, & Brannon, 2009; Jordan & Brannon, 2006). Such difficulties stem from the use of an “approximate number system” rather than a true counting routine that is mastered by human children around the age of 5 years (Gelman & Gallistel, 1978). This means that it is harder for most animals to process and accurately represent a set of six items than a set of three items, for instance, when they must then collect sets of items to match Arabic numerals (e.g., Beran & Rumbaugh, 2001). It is also harder for most animals to discriminate between eight and 10 items than to discriminate between two and four items (e.g., Beran, 2007; Cantlon & Brannon, 2006). From these outcomes, and other experiences, I realized that errors were interesting, too. And so a large part of the research we have done in my lab in recent years has been focused on errors rather than successes. Human cognition, of course, operates to allow our species to flexibly and proficiently interact with our environment, in so-called “physical cognition” and “social cognition” contexts (a distinction I do not really like). However, many of those cognitive processes are fallible. They lead to interesting error patterns, or failures that would appear to be bad when they occur but also appear to be necessary for the otherwise well-oiled “machine” to work well in providing our species with generally reliable information-processing routines that can operate quickly. Humans are a highly visual species, and we rely on visual perception to provide us with information that goes beyond the physical sensations that are recorded by the retina. This normally works well because our visual perception allows us to represent and accommodate figures, shapes, and other kinds of conceptual information (such as size or quantity) that may not necessarily equate with what we sense from the environment. This allows us to deal with occluded stimuli as whole things, to perceive continuity of stimuli, to anticipate future directional movement of stimuli, and to accommodate things such as shading and the relative sizes of things at different distances and spatial scales. Perceptual illusions are the cost for these benefits, as they sometimes result from these basic principles of organization that otherwise provide us with a beneficial psychological interaction with the real world. Humans also rely on an intuitive sense of statistical probability to support rapid and typically accurate decision making. However, the cost of such heuristics comes in the form of biases that result from misunderstanding base rates (i.e., the true probability of events happening) and not recognizing the role that context plays in how we view individual options (e.g., anchoring and framing effects). In addition, acquiring a resource more immediately rather than after a delay conveys advantages (e.g., in foraging or mating contexts), but the cost in always taking something immediately is that sometimes an opportunity is missed for a better reward that is more delayed. Here, there is conflict between impulsivity and self-control, or waiting for a better but more delayed outcome. Such impulsivity is another form of behavioral fallibility that results from suboptimal choice in certain contexts (e.g., when waiting would benefit an organism more than taking something immediately). We have looked at areas in which “failures” of certain processes are known to occur in human cognition in specific contexts. We (and others) have asked whether animals err in ways like and unlike humans with regard to various cognitive processes. We have focused on perceptual errors, largely through studying visual illusions, as well as decisional errors that might reflect failed attentional processing, mistaken understanding of probability, and susceptibility to context cues that might cause animals to rely on heuristics that sometimes lead them astray. I discuss some of that research, and then transition into the question of how nonhuman animals might deal with their own fallibility. Here, our focus has been on two areas: self-control and metacognition. These two areas are of long-standing interest in studies of human psychology, largely because of their importance for healthy decision making in the case of self-control and proficient information processing and decision making in the case of metacognition. I should note that this review is particularly focused on work with nonhuman primate species, because those are the species I study primarily. My goal is to give the reader some sense of how failures and limitations in cognition have motivated our research team to present tasks to these species, and then to see if and when they fail or succeed and whether they can overcome these limitations through cognitive control mechanisms. In each of these areas I discuss, our research team owes a great debt to other cognitive, comparative, and developmental researchers whose methods or ideas we often have borrowed and adapted. For each of the areas I discuss, ranging from perceptual illusions to strategic self-distraction in self-control tests, there are many other research teams doing excellent work, and with an impressive variety of species. Even if I do not cite all of those efforts, they have inspired us and taught us just as much as have our own data. Recognizing the long-standing and continuing need to make our comparative psychology more comparative (Beran, Parrish, Perdue, & Washburn, 2014; Burghardt, 2013; Wasserman, 1997), I hope the reader will forgive the primate-heavy descriptions to come as being merely an indication that sometimes you have to go with what you know best. However, as you will read, if I should ever be a contestant on Let’s Make a Deal, I promise I will take a pigeon with me, not a monkey, and for good reason. As noted, I began my career studying numerical and quantitative abilities of nonhuman primates. Initially, this focus was on counting-like skills, but the focus then shifted more to relative quantity and number judgments with an emphasis on trying to understand the nature of how nonhuman species represent and process quantitative information. As I worked with chimpanzees and monkeys to study their quantity judgments, I learned about certain illusions that occur when humans judge quantities. One of these, the regular-random numerosity illusion (Ginsburg, 1976, 1978, 1980), occurs when humans tend to overestimate the quantity of items in an array that has a consistent and regular arrangement, such as having all items lined up in rows and columns versus one that has a random arrangement. When rhesus monkeys and humans were given the same task, both species showed evidence of this illusion (Beran, 2006). Humans also show a tendency to underestimate the number of items in an array when those items are nested within each other (as with concentric circles) compared to when they are spatially distinct (Chesney & Gelman, 2012), and we found the same bias in rhesus monkeys (Beran & Parrish, 2013). These results were encouraging because they suggested to us that the mechanisms that generate quantity representations across primate species are equally susceptible to illusory phenomena and therefore might reflect fundamental aspects of perceptual processing in at least primates. However, the story may not be this simple. Another perceptual/quantitative illusion that was first reported with humans (including children) is the Solitaire illusion (Figure 1). Even after being told that there are exactly 16 black and 16 white dots in each of these two images, people believe there are more white dots than black dots in the image at left and more black dots than white dots in the image at right. This is a fairly robust phenomenon in humans (Frith & Frith, 1972; Ginsburg, 1982), but apparently not so for some nonhuman primates. For more than a decade, we have tried to demonstrate that nonhuman primates also experience the Solitaire illusion, but we have little to show for those efforts. We presented chimpanzees with two intermixed arrangements of food items, where one type of food item was of high preference and the other of low preference (Agrillo, Parrish, & Beran, 2014). When there was a true quantitative difference between the two sets (i.e., one set had more high-preference items and fewer low-preference items, whereas the other was reversed), the chimpanzees chose the set with more of the high-preference item. However, when we presented the two arrangements in Figure 1, but with high-preference items centrally located or peripherally located, the chimpanzees were indifferent between the choices, as they should have been if no illusory experience occurred. Humans, given photographs of these food arrays, consistently selected the array with the centrally located higher preference items, though, suggesting a species difference in this illusion. We then presented the identical computer task to chimpanzees, rhesus monkeys, capuchin monkeys, and adult humans in which they had to choose one of two arrays that had more dots of a certain color. All species were proficient when there were real differences in numbers of dots. Humans also showed a bias to choose the array with centrally located dots of the target color versus peripherally located dots when both sets actually had equal numbers of each color. Chimpanzees showed no such illusion, and the evidence for the illusion from the monkeys was weak (Agrillo et al., 2014). We subsequently presented that task to human children and found that younger children were less susceptible to the illusion than older children; we also found that some capuchin monkeys seemed to experience the illusion (Parrish, Agrillo, Perdue, & Beran, 2016). However, it remains unclear as to whether there is something fundamentally different in how various species respond to this kind of stimulus arrangement. If humans are unique in robustly perceiving this illusion, this could highlight specific brain-based or environmental factors that contribute to such illusory experiences. It would be informative to assess this illusion across human cultures, which in conjunction with a broader phylogenetic assessment could tell us something about the role of experience in perceiving this illusion. To our knowledge, this illusion has not been presented to other species beyond those we have tested. We hope this will change in the near future, because broad phylogenetic assessments of other illusions have given us interesting insights into perceptual similarities and dissimilarities across species. Figure 1. Top. The Solitaire illusion. Despite both figures having 16 white and 16 black dots, humans’ initial impressions of these arrays often is that there are more white dots than black dots in the array at left and more black dots than white dots in the array at right. These stimuli were presented in Agrillo et al. (2014) and Parrish et al. (2016) to children, chimpanzees, and monkeys. Bottom. The Ebbinghaus-Titchener illusion. 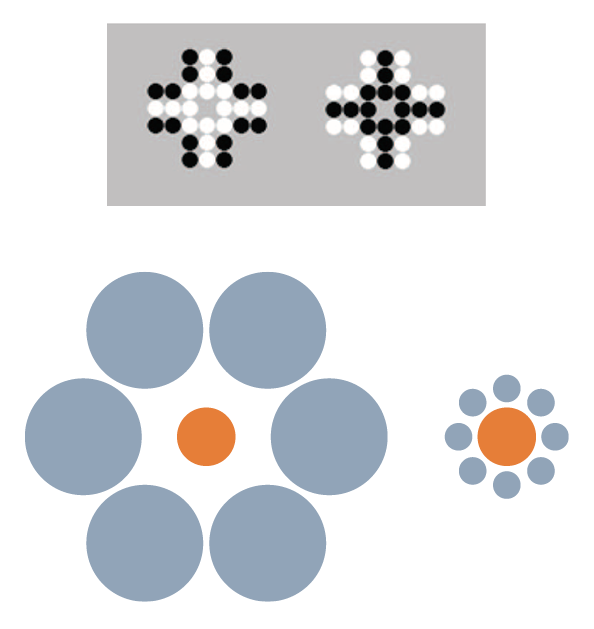 As a result of the juxtaposition of circles, the central orange circle surrounded by blue large circles (left image) appears smaller than the central orange circle surrounded by small blue circles (right image). For example, there are sometimes opposite reactions across species to visual stimuli. One example of this is Ebbinghaus-Titchener illusion (Ebbinghaus, 1902; Weintraub, 1979; Figure 1), which has been presented to a variety of nonhuman animal species but with highly variable results. Baboons do not experience the illusion (Parron & Fagot, 2007) despite showing other visual illusions (e.g., Barbet & Fagot, 2002; Benhar & Samuel, 1982). This might suggest human-uniqueness in seeing this illusion, as would the reported reversed Ebbinghaus-Titchener illusions in pigeons (Nakamura, Watanabe, & Fujita, 2008) and bantam chickens (Nakamura, Watanabe, & Fujita, 2014). However, the story again is not that simple, as other nonprimate species have shown evidence of perceiving this illusion in the direction shown by humans (dolphin: Murayama, Usui, Takeda, Kato, & Maejima, 2012; domestic chicks: Rosa Salva, Rugani, Cavazzana, Regolin, & Vallortigara, 2013; redtail splitfin fish: Sovrano, Albertazzi, & Rosa Salva, 2015). And, as outlined in more detail next, our work suggests that monkeys show evidence of a related illusion called the Delboeuf (1865) illusion (Parrish, Brosnan, & Beran, 2015). In all of these cases, the key issue is that studying illusions across species rather than just in humans tells us about factors that might contribute to their occurrence. Those factors likely are not the result of differences in sensory experiences but instead reflect differences in brain processes that deal with those sensory experiences, perhaps in combination with specific individual experiences with particular kinds of stimuli. Perception impacts decision making, and context affects perception, thereby also impacting decision making and choice behavior. Many context effects have been studied in humans (e.g., Coren & Girgus, 1978; Gigerenzer & Goldstein, 1996; Hastie & Dawes, 2010; Kahneman, 2003; Tversky & Kahneman, 1981), highlighting another area of fallibility in human judgment and decision making. For example, framing questions in terms of wins versus losses can impact choices that people make, and usually with greater risk aversion when choices are framed in terms of losses. There is growing interest in those kinds of context effects in nonhuman animals (e.g., Lakshminarayanan, Chen, & Santos, 2011; Ludvig, Madan, Pisklak, & Spetch, 2014; B. Marsh & Kacelnik, 2002). These effects often can be shown in food-choice experiments, which are particularly appealing because one does not need to train an animal to try to obtain the best or largest food reward. Rather, one can use this natural food choice paradigm (Silberberg, Widholm, Bresler, Fujita, & Anderson, 1998) to look at spontaneous decisions that might be affected by contextual cues that are not directly related to food amount or quality. Chimpanzees are excellent discriminators of food amounts, sometimes rivaling human performance in telling apart very small differences (E. W. Menzel, 1960, 1961; E. W. Menzel & Davenport, 1962). In addition, like adult humans, they and other great apes appear to understand conservation of quantity (e.g., Call & Rochat, 1996; Muncer, 1983; Suda & Call, 2004, 2005; Woodruff, Premack, & Kennel, 1978). However, they also sometimes show biases that are suboptimal to the goal of obtaining the most food. For example, they will choose a smaller overall amount of food from one set of items over a larger amount of food in another set if that first set contains the largest individual food item (e.g., Beran, Evans, & Harris, 2008; Boysen, Berntson, & Mukobi, 2001). Thus, we were interested to see if they might be as susceptible as are humans to biases that come from stimulus presentation even in a context in which optimizing intake was the motivation behind choice behavior. We used this approach with chimpanzees to examine in more detail the Delboeuf illusion (Figure 2), and particularly in a setting in which this illusion is reported to underlie human errors in food estimation. When humans look at food, their perception of portion sizes can be strongly affected by the context in which that food is presented. The size, the color, and the shape of containers holding food directly impact how people estimate the amount of food they are looking at (e.g., Wansink, 2004, 2006; Wansink & Cheney, 2005; Wansink, Painter, & North, 2005; Wansink & van Ittersum, 2003; Wansink, van Ittersum, & Painter, 2006). For example, people will serve themselves less food when given a small plate and more food when given a large plate, apparently without realizing that they are doing this; their estimates of food amounts also are affected by plate size (e.g., Van Ittersum & Wansink, 2007). This also is true in situations such as feeding one’s dog, where container size impacts how much is served (Murphy, Lusby, Bartges, & Kirk, 2012). For our purposes, we created a task for the chimpanzees to match that used with humans in which portions on small plates were reported to be larger than the same portions served on large plates. Like humans, chimpanzees made the same mistake in overestimating food quantity on small plates compared to large plates (Parrish & Beran, 2014b). The chimpanzees chose between round slices of food or piles of cereal pieces (Figure 2). When plate size was controlled (i.e., both plates were large or both were small), the chimpanzees selected the larger amount of food. When equal amounts of food were on plates of different sizes, they showed a bias to choose the smaller plate, presumably because they perceived it as holding more food. In some cases, they even selected a truly smaller amount of food presented on a smaller plate, thereby showing that this contextual effect negatively impacted performance in a way that directly affected intake. Figure 2. (A) The Delboeuf illusion. When two same-sized central circles (shown here as black dots) are surrounded by concentric circles of difference sizes, people tend to perceive the dot inside the smaller concentric circle to be larger than the dot inside the larger concentric circle. 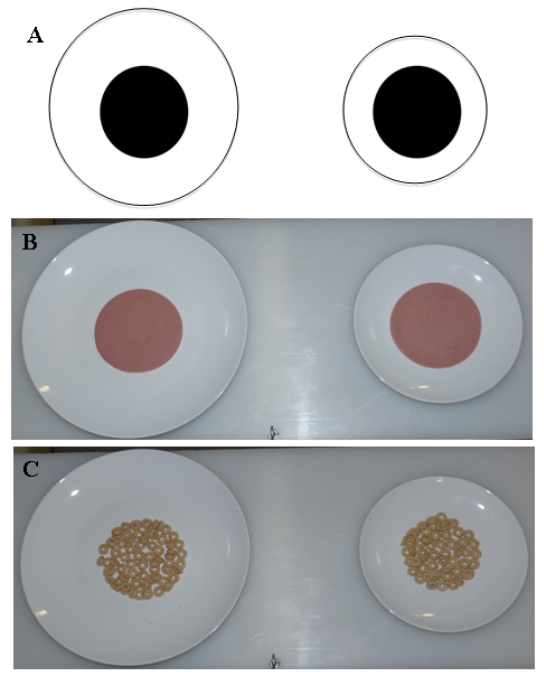 (B) and (C) Food stimuli presented to chimpanzees in Parrish and Beran (2014a). These arrangements were used to mimic the Delboeuf illusion in a food discrimination task. In (B), the food portions are equal, but chimpanzees tended to prefer the portions on the smaller plate. In (C), the smaller plate actually holds less food than the larger plate. The chimpanzees tended to be indifferent between these options despite an objective difference in the amounts on these plates. Reprinted from “When Less Is More: Like Humans, Chimpanzees (Pan troglodytes) Misperceive Food Amounts Based on Plate Size,” by A. E. Parrish and M. J. Beran, 2014, Animal Cognition, 17, p. 428. Copyright 2014 by Springer. Other context effects also impact food choice in chimpanzees. Humans show a “less-is-better” effect when they value things such as ice cream. If a large container holds more ice cream than a small container, people tend to place greater value on the smaller amount of ice cream, because it appears to more completely fill or overflow its container (Hsee, 1998). Chimpanzees fall prey to the same bias. 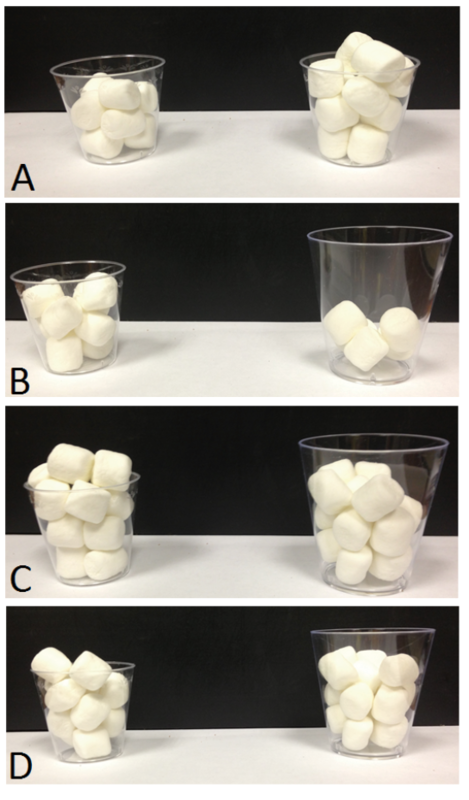 When given marshmallows or gelatin in small or large transparent cups, they preferred cups that looked more filled, even if those contained a smaller amount of food (Parrish & Beran, 2014a; Figure 3). Even aspects of food items that do not impact their quality or quantity, such as their wholeness, seem to affect chimpanzee choice behavior. For example, chimpanzees sometimes prefer sets of snack chips that contain less overall food if those chips are whole compared to sets of more overall food but broken pieces. This is true even though there is no difference in how long it takes the chimpanzees to eat the food (Parrish, Evans, & Beran, 2015a). Something about the wholeness of the items increases their subjective value without having any seeming connection to their objective value (or, conversely, it may be that brokenness decreases subjective value). Of course, one can imagine a heuristic that could account for this bias, such as “Choose sets with the best individual items in them.” This heuristic may be adaptive for certain foraging environments in which the best items to acquire are not necessarily those in the greatest abundance (i.e., quantity) but those that have specific characteristics (such as being the largest items, which may correlate with things like ripeness). That such heuristics may be shared across species speaks to the nature of a general cognitive system that balances “shortcuts” for speedier choices against mechanisms that otherwise are excellent at representing quantities accurately. Figure 3. Example trials presented to chimpanzees in Parrish and Beran (2014b). (A) Equal-sized cups hold eight items (left) and 12 items (right), and chimpanzees were highly proficient at choosing the larger amount. (B) The smaller cup holds more items, making this a very easy discrimination. (C) Cups differ in size, but each holds 15 items. Chimpanzees sometimes showed a preference for the smaller cup, which appears to be more full. (D) The smaller number of items is in the smaller cup, and this condition also sometimes produced errors in chimpanzees. Reprinted from “Chimpanzees Sometimes See Fuller as Better: Judgments of Food Quantities Based on Container Size and Fullness,” by A. E. Parrish and M. J. Beran, 2014, Behavioural Processes, 103, p. 189. Copyright 2014 by Elsevier. Other context effects also are evident across species. Take, for example, the well-known decoy effect, in which one’s preferences among two items shift when a third item is introduced, even though one has no desire to choose the third item. Yet that weaker item, which is dominated in comparison to either of the two other choices, changes how one feels about those two other choices (Huber, Payne, & Puto, 1982). For example, if offered the choice between front-row seats to a concert for $200 or 50th-row seats for $100, you may see both options as equally appealing. However, if you then were offered the choice of 50th-row seats for $150, not only would you reject that choice immediately but you may see the $100 tickets for the 50th row as a better choice than the front-row seats. Decoy effects have been documented in situations where human consumers evaluate products (e.g., Pettibone & Wedell, 2000; Wedell, 1991) and evaluate mate choices (Sedikides, Ariely, & Olsen, 1999). There is also evidence that animals may be affected by decoy stimuli (e.g., honeybees: Shafir, Waite, & Smith, 2002; hummingbirds: Bateson, Healy, & Hurly, 2002; Hurly & Oseen, 1999; starlings: Bateson, 2002; Schuck-Paim, Pompilio, & Kacelnik, 2004; cats: Scarpi, 2011). For monkeys, such decoy effects occur even for nonedible stimuli in computerized tasks. We presented rhesus monkeys with a size discrimination task (Parrish, Evans, & Beran, 2015b). This approach came from work with humans in which they were asked to judge the size of rectangles in various orientations (Trueblood, Brown, Heathcote, & Busemeyer, 2013). When an asymmetrically dominated decoy was present on a trial, it changed how people responded to the other stimuli. We adapted this test for monkeys by first training them to choose the larger of two rectangles on-screen in terms of area. One rectangle was taller and less wide, and the other was wider and less tall, thereby giving us two dimensions (height and length) that could factor into a global area “value” for that option. Once monkeys were proficient in choosing the larger rectangle, we could introduce our decoy, which was the smallest of the three options on-screen but matched the orientation of one of the other options. When it matched the truly larger rectangle’s orientation, performance improved even more in terms of the monkeys selecting the largest item. When it matched the orientation of the smaller of the other two rectangles, it decreased performance. Thus, although the decoy rarely was selected itself, it changed how the monkeys appeared to perceive the other two options, and in a way that reflected perceptual-processing biases much like those that occur when people are trying to compare options that can vary on nonperceptual factors (such as cost and distance in the example about concert seats). The response time data in that experiment (Parrish et al., 2015b) also were interesting. When monkeys made a correct choice of the largest rectangle, they did so the fastest when a “helpful” decoy was present (i.e., the decoy matched the orientation of the truly larger of the other two rectangles). However, when the decoy was potentially “hurtful” (i.e., it matched the orientation of the smaller of the other two choices), it took the monkeys longer to make the correct choice, as if they had to expend extra time processing the stimuli more effortfully. When monkeys made errors, they took the longest time to respond when the decoy was actually helpful, perhaps because the decoy was doing its job and drawing attention to the truly largest rectangle, even though the monkeys hesitated and then chose incorrectly. Thus, normally excellent perceptual discrimination skills in monkeys can be disrupted by objectively irrelevant information such as a decoy that is rarely chosen. That decoy illustrates a susceptibility to failure at an otherwise easy task because of contextual information. The Monty Hall Problem is one of my favorite examples of how poorly humans understand probability, and how readily we make assumptions that, at face value, feel so accurate that we do not consider whether they might be incorrect. The problem itself was part of the basis for a popular game show called Let’s Make a Deal that first aired in the 1960s and featured host Monty Hall. In the game, you are given three choices of possible locations of a reward, with the two incorrect choices giving you nothing.1 After you choose one of the options, basically randomly because you cannot possibly know where the reward is located, you are then shown one of the unchosen places that does not hold the reward. Then you are asked if you want to keep your first choice or switch to the third choice, before seeing what is under both. The correct decision is to switch, because you double your odds of winning (Selvin, 1975), but few people appreciate why that has to be true (Krauss & Wang, 2003). More often, people will stick with their first choice because they are afraid to find out they were right but then switched (Burns & Wieth, 2004; Gilovich, Medvec, & Chen, 1995), or they will switch (or stay) because they say it no longer matters, and the odds are 50:50 for winning. However, the odds of winning by sticking with the first choice are actually only 33%, whereas the odds of winning by switching are 66%. The first part is a little easier to understand, because of course in choosing at the outset you know you have a 1:3 chance of being right, and then, if you think about it, by not switching you just stick with that 1:3 chance. It is the revelation of an empty (or joke prize) location that confuses people. They do not readily understand that the omnipotent game show host (or whoever is running the game) is forced to inform the contestant indirectly about the winning location two thirds of the time because two thirds of the time the player has picked one of the two empty (or joke prize) locations! Thus, only the other loser location can be shown, and the winning locations is thus the choice to which one can switch. If you followed that, excellent! If not, even better, because it turns out you are not alone among your species (Friedman, 1998; Granberg, 1999; Granberg & Brown, 1995; Granberg & Dorr, 1998) or even among the primates. We tested rhesus monkeys and humans on the same computerized version of this game and gave them many trials to try to figure out how to maximize their wins (Klein, Evans, Schultz, & Beran, 2013). At first, both species showed indifference when asked whether they wanted to switch. With greater experience and many repeated trials, some humans and some monkeys began to switch more often than they stayed with their first choice, but only one monkey (out of seven) and only three humans (out of 15) switched at or near 100% of the trials by the end of the experiment. Many members of both species remained indifferent (Figure 4). Figure 4. The percentage of switch choices for each monkey and each human participant tested in Klein et al. (2013). The data are divided into 100-trial blocks for each participant. An asterisk located above or below an individual bar indicates a significant switch or stay bias, respectively. An asterisk located above or below a bracket indicates an experiment-wide significant switch or stay bias, respectively. Reprinted from “Learning How to “Make a Deal”: Human (Homo sapiens) and Monkey (Macaca mulatta) Performance When Repeatedly Faced With the Monty Hall Dilemma,” by E. D. Klein, T. A. Evans, N. B. Schultz, and M. J. Beran, 2013, Journal of Comparative Psychology, 127, p. 106. Copyright 2013 by the American Psychological Association. This was an interesting result for us, and suggested another clear commonality across species in terms of seeing failures to earn rewards as a spotlight on how probability estimation works (or, more accurately, fails to work), even with repeated experience. Once again the story was not that simple, if one decided to ask pigeons how they would play the Monty Hall game. It turns out that if you want advice on how to best play the game, ask a pigeon. Herbranson and Schroeder (2010) gave pigeons and humans repeated chances to play the Monty Hall game and found, again, that humans failed to adopt optimal strategies, even with extensive training. But pigeons came to switch on nearly all trials, and thereby achieved nearly optimal levels of reward. Additional tests showed that the failure by humans and the success by pigeons came from different approaches to the repeated testing. 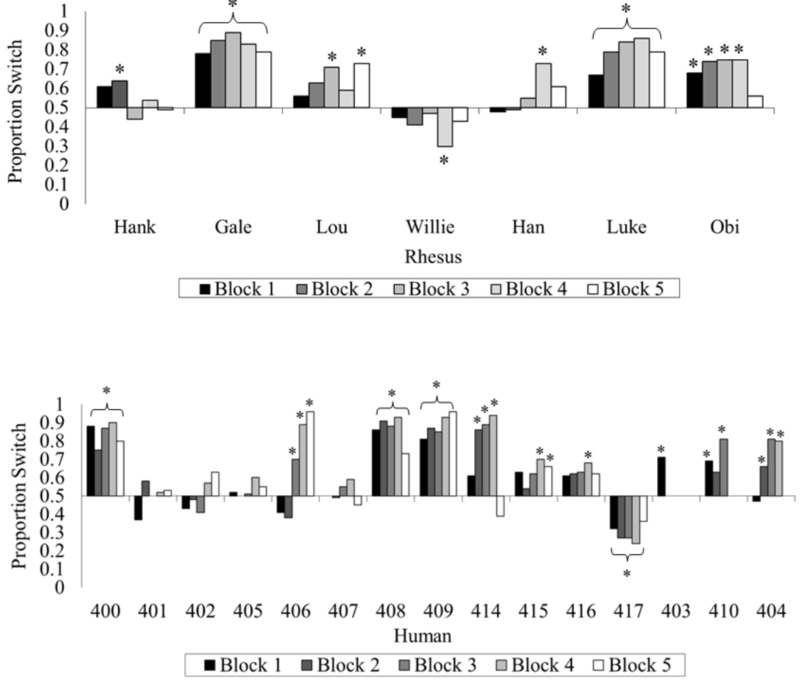 Pigeons learned exactly what sequence to repeat across trials by finding the one with the highest reinforcement rate and just repeating that sequence of responses to the stimulus arrangement. Humans, however, continued to vary their responses throughout the experiment in terms of first “door” chosen, and so forth, possibly in an effort to find a strategy that they thought might afford them more wins than was possible using the truly optimal strategy of just switching every trial (Herbranson & Wang, 2014). In other words, humans erroneously thought that there might have been a strategy that led to more wins, in addition to showing the biases that emerge from use of faulty reasoning about probability and other heuristic response strategies (see Herbranson, 2012, for more discussion). This is a case in which monkeys matching humans in task performance highlights the suboptimality of those species compared to a more phylogenetically distant species such as the pigeon. Perhaps this is because of shared cognitive biases that reflect approaches to information processing that are quite different in primates from some other species. It is the fallibility of the primates (human and nonhuman) that is fascinating in relation to the proficiency and seeming mastery of pigeons in this task. Those species differences remind us of the importance of considering evolutionary histories of species as they are reflected in response strategies (Herbranson, 2012), although it is important to note that in other cases, pigeons demonstrate suboptimal choices similar to those seen in humans (e.g., McDevitt, Dunn, Spetch, & Ludvig, 2016; Zentall, 2015). Thus, there is not a clear picture of what factors best predict susceptibility to decisional biases across species. One of the most striking “failures” repeatedly demonstrated in comparative cognition comes from the reverse-reward contingency task. This task involves presenting animals with two sets of food items and giving them the one they do not choose. Boysen and Berntson (1995) were the first to report that chimpanzees continually failed to learn to point to the smaller amount of food to receive the larger amount, and in fact even struggled to point to smaller amounts of rocks over larger ones to gain the bigger reward (Boysen, Mukobi, & Berntson, 1999), even though they could succeed when symbolic stimuli (Arabic numerals) were used (Boysen, Berntson, Hannan, & Cacioppo, 1996). Chimpanzees are not alone in these failures, as lemurs (Genty, Palmier, & Roeder, 2004; Genty & Roeder, 2007), squirrel monkeys (Anderson, Awazu, & Fujita, 2000), mangabeys (Albiach-Serrano, Guillén-Salazar, & Call, 2007), tamarins (Kralik, Hauser, & Zimlicki, 2002), macaques (Murray, Kralik, & Wise, 2005; Silberberg & Fujita, 1996), and the other great apes (Uher & Call, 2008; Vlamings, Uher, & Call, 2006) also show limited or no success on this task. Although a number of studies carefully look at what is necessary to generate better responding (see Shifferman, 2009, for an overview), the point here is that this task seems to highlight a real difficulty with a form of behavioral inhibition when food items are used. When I first read the early work in this area (and confirmed that the chimpanzees I worked with also struggled with this task), it led me to think about other ways in which primates might show good inhibition, particularly in tasks that required delay of gratification. The goal at first was to see if they could delay gratification, and then to see how nonhuman primates might attempt to deal with their own fallibility in terms of their intertemporal choices. To do this, we adapted from the developmental literature (e.g., Toner & Smith, 1977) a task now commonly referred to as the accumulation task. Originally, chimpanzees and an orangutan showed that they could wait as food items accumulated, one at a time, within their reach, with the only rule being that more items accumulated as long as the apes did not eat any (Beran, 2002). Subsequent experiments involved fully computerized apparatus controlling the accumulation, to prevent any experimenter cuing (e.g., Beran & Evans, 2006). Chimpanzees had to perform a computer task to accumulate food rewards that they also had to inhibit eating if they wanted to maximize what they could earn for the sessions (Beran & Evans, 2009). We consistently found that chimpanzees waited to accumulate rewards, as do other apes (Parrish et al., 2014; Stevens, Rosati, Heilbronner, & Mühlhoff, 2011). Monkeys show more variable performances on accumulation tasks and other delay of gratification tasks (e.g., Addessi et al., 2013; Anderson, Kuroshima, & Fujita, 2010; Evans & Beran, 2007b; Evans, Beran, Paglieri, & Addessi, 2012; Pelé, Micheletta, Uhlrich, Thierry, & Dufour, 2011). Showing self-control through delay of gratification also can be incredibly difficult for humans, with failures in the form of overeating, smoking, drug use, and inadequate financial savings all leading to highly negative future outcomes. Yet there are strategies that can lead to improved delay of gratification in humans, including children, such as reducing the visibility of the reward, transforming how one thinks about the reward, or even self-distraction techniques to provide alternate foci for attention (e.g., Mischel, 1974, 1981; Mischel & Baker, 1975; Mischel & Ebbesen, 1970). Can chimpanzees use any of these strategies? It turns out they can. Evans and Beran (2007a) gave chimpanzees an accumulation test in one of three conditions. In the first, there was simply an accumulating set of reward items they could take at any time (but at the cost of ending any additional accumulation). In the second, the chimpanzees also were given items they could engage with (paper, crayons, magazines, and other toys) while the reward items accumulated. As expected, there was a difference in how long the chimpanzees waited between these two conditions, with longer wait times in the condition with something else to do. This might have been solely due to the necessary distraction that such items provide just through their presence and how they attracted the attention of the chimpanzees. Although this would facilitate better delay of gratification, those conditions alone cannot tell one anything about whether chimpanzees have an awareness of their fallibility in this situation, or whether they might somehow appreciate the conflict they are under when facing preferred rewards that they want to eat but also having the chance to get even more of those rewards, if they can. This is where the third test condition came into play. In that condition, the chimpanzees again had the items to play with during trials, but now the accumulating set was never in reach. Instead, exactly the same number of items was dispensed as on a yoked trial in the condition where toys were present, and the chimpanzees had to inhibit eating the accumulating food rewards. The only difference between these conditions was that one required self-imposed delay of gratification and one condition placed an externally imposed delay on the chimpanzees. If the chimpanzees engaged the toys specifically because they needed a distraction, then toy use should have been more frequent in the self-imposed condition compared to the externally imposed condition. Three of four chimpanzees showed this pattern, reflective of self-distraction—a form of cognitive control that allowed them to deal with an apparent sense of their own fallibility in this task. Whether other species, including other primates, might employ such self-distraction techniques is not known, although there is some suggestive evidence that a grey parrot engaged in self-distraction strategies during a delay of gratification test (Koepke, Gray, & Pepperberg, 2015), and other bird species can succeed in delay of gratification tasks (e.g., Auersperg, Laumer, & Bugnyar, 2013; Hillemann, Bugnyar, Kotrschal, & Wascher, 2014). This area of research serves as another reminder of why broad assessments across species, and the use of differing methods within species, can change how we think about animal choice behavior. Much of the early research with pigeons and rats indicated that animals showed little or no self-control, often discounting future rewards even on a scale of a few seconds (see Logue, 1988). However, using new tests such as the accumulation task, as well as tasks that make use of food exchanges to obtain delayed, more valuable rewards (e.g., Beran, Rossettie, & Parrish, 2016; Dufour, Pelé, Sterck, & Thierry, 2007; Dufour, Wascher, Braun, Miller, & Bugnyar, 2012; Pelé, Dufour, Micheletta, & Thierry, 2010), or tasks that require animals to move farther to obtain better rewards (e.g., Stevens, Hallinan, & Hauser, 2005), or tasks that substitute tokens for food rewards (e.g., Jackson & Hackenberg, 1996; Judge & Essler, 2013), indicate that animals sometimes do show self-control and can delay gratification. In addition, varying aspects of experimental design shows that some species that normally are impulsive will make use of opportunities to force themselves to choose the later reward (Ainslie, 1974; Grosch & Neuringer, 1981; Rachlin & Green, 1972). Species differences also emerge on the same task and can be accounted for by differences in ecology (e.g., Stevens et al., 2005). For some species such as chimpanzees, there are tasks that require certain forms of inhibition that they seem to lack, such as pointing at less food to obtain more food (Boysen & Berntson, 1995), whereas in other tasks, such as the accumulation task, they perform very well (Beran, James, Whitham, & Parrish, 2016). Thus, as is true with humans, there does not appear to be a single “self-control” ability in other animals, but rather a range of performances from very impulsive to highly self-controlled. This highlights the value of continued comparative research to study the success and fallibility of self-control in delay of gratification tasks and intertemporal choice tasks. Metacognition often is referred to as thinking about thinking (Flavell, 1979; Metcalfe & Shimamura, 1994; Nelson, 1992), and its utility, in large part, comes from how it allows organisms to recognize their own cognitive strengths and weaknesses in terms of perception, memory, knowledge, and problem-solving ability. Humans use metacognition when they decide if they know enough to act, or are at risk for error, and then adapt their behavior accordingly. When the risk of error is deemed too high, they hesitate, ask questions, seek information, or wait for clarification. Here, again, there is evidence that other animals may do this also. There are a wide range of tasks given to animals to assess their metacognitive abilities, and this area of research remains contentious with regard to how best to interpret the data that result from those tasks (e.g., Carruthers, 2008; Crystal, 2014; Crystal & Foote, 2009, 2011; Hampton, 2009; Jozefowiez, Staddon, & Cerutti, 2009; Kornell, 2009, 2014; Le Pelley, 2012; Smith, 2009; Smith, Beran, Couchman, & Coutinho, 2008; Smith, Couchman, & Beran, 2012). A special section of one issue of Comparative Cognition and Behavioral Reviews (2009, Volume 4) highlights these debates and the great interest in the question of animal metacognition. My goal here is not to rehash those debates but instead to suggest that some of the tasks that have been developed do provide a window into how and when nonhuman primates attempt to overcome their fallibility by seeking needed information. Call and Carpenter (2001) introduced the information-seeking task to the field using a simple but compelling approach. Chimpanzees, orangutans, and children either saw rewards being hidden in one location within an array or did not, and then they either could look for those items or just reach for them. The idea was that if they saw the item, and therefore knew where it was, there was no need to look first. But if they had not, then they needed to look. This was the pattern that was observed. Later, it was reported that rhesus monkeys showed a similar response pattern (Hampton, Zivin, & Murray, 2004). Criticisms emerged regarding how best to interpret why the animals differentially responded to these two objectively different conditions (seeing the item hidden or not), and whether metacognition had to underlie such performance (e.g., Carruthers, 2008; Crystal & Foote, 2011). From these critiques came new empirical efforts, showing more flexible response patterns by great apes across varied conditions that increased or decreased the effort needed to obtain information and other manipulations. Call (2010) presented all four great ape species with the information-seeking task and manipulated the degree of visual access the apes had to the baiting, as well as the effort required to look for baited items. He also manipulated the time between baiting and when the apes could make a choice, and he manipulated food quality. These apes performed well in choosing the correct location when they saw the baiting, and they looked for information more often when they had not seen the baiting. They were more likely to look before choosing after a longer delay between baiting and when they could choose. However, when they were given auditory information (when experimenters shook the opaque tubes) that could inform them as to where the reward was hidden, they relied less on looking into the tubes before choosing. This suggests a type of inference that replaced the need for visual information. Increasing the cost of checking also reduced that behavior before choosing. H. L. Marsh and MacDonald (2012a) also showed that orangutans could make inferences that replaced the need to look for more information, highlighting that something like a generalized search strategy (a nonmetacognitive account) was not responsible for choice by those orangutans. H. L. Marsh and MacDonald (2012b) gave orangutans a variety of tests like those used by Call; they reported that the orangutans would more often search for information when it was easy to do so rather than hard. They also searched more often for information when the odds of making an error were greatest and when the reward amount was greater. In all of these studies, the apes’ behavior suggests that information-seeking behaviors are flexible and spontaneously employed, as is true for humans. Our contribution took a slightly different form, largely because we had the opportunity to ask our chimpanzees what they knew (or not) about the identity of items rather than the location. Language-trained chimpanzees can name what they see or remember (e.g., C. R. Menzel, 1999), and this allows us to present a new version of the information-seeking task (Beran, Smith, & Perdue, 2015). Our chimpanzees always knew where food was located, but it was consistently in an opaque container. Sometimes they knew what the food was because we showed them before we moved the container, but other times they did not. They had to name the item correctly in order to receive it, and so in our task, seeing an item allowed the chimpanzees to name it more immediately but not seeing it would require going to look into the container first before trying to name it (and this added time and effort to the trial). 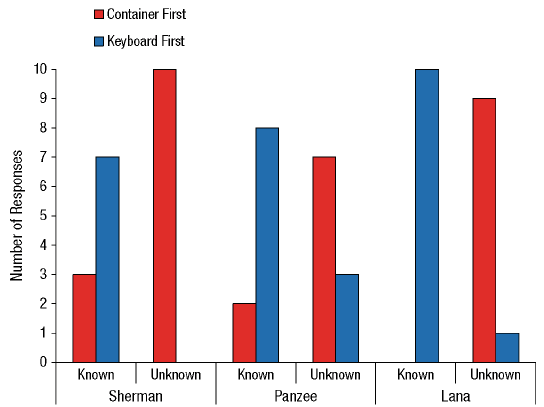 The chimpanzees were significantly more likely to look into the container first before naming when they had not seen the item being placed in the container than when they had (Figure 5). Figure 5. Chimpanzee information-seeking results from Beran et al. (2013). In this experiment, each chimpanzee completed 10 trials where they already saw food in the container that was moved to the naming area (known condition) and 10 trials where they saw food, but in the container that was not moved (unknown condition). In the latter case, the container that was in the naming area had unknown contents, and thus the chimpanzees should have been more likely to look into that container before trying to name anything. Reprinted from “Chimpanzee Cognitive Control,” by M. J. Beran, 2015, Current Directions in Psychological Science, 24, p. 355. Copyright by M. J. Beran. The data shown in the figure originally were reported in “Language-Trained Chimpanzees (Pan troglodytes) Name What They Have Seen, but Look First at What They Have Not Seen,” by M. J. Beran, J. D. Smith, and B. M. Perdue, 2013, Psychological Science, 24, p. 664. Copyright 2013 by the Association for Psychological Science. These results helped address some of the nonmetacognitive accounts for earlier tests, but these results also faced another possible nonmetacognitive interpretation. Perhaps the chimpanzees learned to name what they saw, and if they saw nothing, to name nothing. Such a strategy would be effective but would not require attending to one’s own knowledge state. To see if this strategy was at work, we modified the task. Now chimpanzees always saw a food item in one of two containers, but the contents of the second container remained unknown. Then, one of the two containers was moved to the area where the chimpanzees could name or could look into the container to see what was inside. In this case, there was always a food to be named but only half of the trials involved that food being the one that should be named. When the chimpanzees saw the container with the known food item being moved to the area where they could name it, they named it directly. When the other container, with the unknown item, was the one they were questioned about, they were more likely to first look inside before naming anything. These patterns suggest that the chimpanzees monitored their knowledge states. When they could name items, they did, and when they could not, they recognized in some way this inability and remedied it by seeking more information. Of course, we do not know how this felt to the chimpanzees as they did it, and whether they had any metarepresentational awareness of themselves in these states of ignorance or knowledge. These results, now with various apes in different information-seeking tasks (Call, 2010; Call & Carpenter, 2001; H. L. Marsh & MacDonald, 2012a, 2012b), suggest that, as with the delay of gratification situations, great apes can deal with fallibility adaptively, and in ways that appear controlled and strategic in the sense that information is gathered, resources are used effectively, and goals are accomplished in the face of competing response strengths such as taking accumulating items early or naming whatever one has seen. Great apes are not the only species that seek information. Rhesus monkeys, given a variation of the Call and Carpenter (2001) paradigm, also looked into tubes more often when they did not view the baiting of those tubes (Hampton et al., 2004). Interesting to note, capuchin monkey did not perform well with this task (Basile, Hampton, Suomi, & Murray, 2009), and this result matched later research using psychophysical discrimination tasks that also showed a lack of uncertainty monitoring in capuchin monkeys relative to rhesus monkeys (Beran, Smith, Coutinho, Couchman, & Boomer, 2009). This apparent species difference in metacognition may reflect a difference in risk sensitivity between these species (Beran, Perdue, & Smith, 2014), although more work is needed on this question. It is clear that some species, in some circumstances, reflect on what they do or do not know, and can control information-seeking responses in a way that allows them to avoid making errors. Comparative approaches to studying cognition offer important insights that allow us to more fully appreciate human cognition. The study of other animals and how they interact with their environments, process information, and generate responses provides us with a psychological account of how minds work—not just human minds, but all minds. In addition, a comparative approach gives us a context in which to view human behavior and cognition, and that context takes into account the evolutionary history, ecology, and experiences of organisms. Often, we find commonalities across species that are useful for thinking about how and why we think and act the way that we do. In many cases, this happens when we learn that other animals are capable of modes of thinking that might otherwise be considered uniquely human. In other cases, some impressive aspects of human cognition remain at least partially distinct from the cognition of other species, or perhaps manifest to a degree as yet unseen in other species. In those cases, differences are relevant. Not all that humans do is impressive, productive, and successful with regard to cognitive processing of information from the environment. Misperceptions, biases, and fallacies produce bad decisions in our species, and comparative approaches are valuable here too. I have discussed some cases where we share fallibilities with other species, and in at least one case (the Monty Hall Problem), I have shown that we suffer where another species may thrive on a certain kind of problem. There are many other similar cases to that one, and those comparisons are important too, especially if one views cognitive processes less from the perspective of seeing those processes as leading only to “intelligent” decisions but instead also seeing cognitive processes as being susceptible to errors, biases, and flawed decision making. Much of what I presented in this article was focused on nonhuman primates, and often the focus in these areas of research is on chimpanzees, the closest living relatives of humans. Although this is a great starting point, our comparative investigations need to be more comparative (e.g., Beran, Parrish, et al., 2014; Burghardt, 2013; Wasserman, 1997). In some cases, data from other species are being collected, but in many instances we have yet to even begin to fill in a “phylogenetic” map regarding perceptual illusions, cognitive biases, and the use of heuristics. We need to determine whether other animals fall prey to illusions such as the Delboeuf illusion and other perceptual illusions. Regarding decisional biases, we need to expand how many species are tested. For example, although primates and pigeons vary in their ability to master the Monty Hall Problem, we know nothing about whether rats, corvids, marine mammals, dogs, or other species would perform more like pigeons or primates. It would be exciting, as another example, to present more species with the Solitaire illusion, largely because that illusion seems to occur so strongly in humans but only fleetingly in other species. The stimuli are readily accessible to any species that relies on vision, and there are many ways one could see how animals perceive those arrays. We also need to examine other forms of biases such as anchoring effects on choice behavior. Although recent years have shown increased testing of nonprimate species on metacognition tasks (Adams & Santi, 2011; Castro & Wasserman, 2013; Foote & Crystal, 2012; Roberts et al., 2008; Smith et al., 1995; Sutton & Shettleworth, 2008), more work is needed to understand how and when animals might monitor and control their perceptions, memories, and decisions. In some areas, broad species assessments have been made. For example, tests of inhibition presented across many species have been informative (MacLean et al., 2014), and excellent approaches have been offered to examine evolutionary pressures that may impact things such as intertemporal choices (e.g., in primates: Stevens, 2014). It would be fairly easy to test more species using a task such as the accumulation test, to look at self-control and delay of gratification across a wide variety of species, and some of this work has begun (e.g., Koepke et al., 2015; Vick, Bovet, & Anderson, 2010). Although data from nonhuman primates remain essential in comparative cognitive science, the best way to understand human cognition and its evolution requires a wider lens. To understand what makes humans unique requires understanding what other species can do. This is true for accurate perceptual experiences and successful decision making, but also for failures. As a field, we continue to develop methods that can be used with many species and that can highlight aspects of cognitive evolution (see MacLean et al., 2012). From that perspective, we should try to understand how other animals not only apply successful cognitive processes to problems but also unsuccessful cognition to problems that generate errors. Flawed and error-prone animal minds are valuable in understanding flawed and error-prone human minds and in understanding the utility of cognitive processes not only for their successes but also for their occasional failures. Beran, M. J. (2006). Quantity perception by adult humans (Homo sapiens), chimpanzees (Pan troglodytes), and rhesus macaques (Macaca mulatta) as a function of stimulus organization. International Journal of Comparative Psychology, 19, 386–397. Beran, M. J., Brandl, J., Perner, J., & Proust, J. (Eds.). (2012). Foundations of metacognition. Oxford, UK: Oxford University Press. Beran, M. J., Parrish, A. E., Perdue, B. M., & Washburn, D. A. (2014). Comparative cognition: Past, present, and future. International Journal of Comparative Psychology, 27, 3–30. Boysen, S. T., & Capaldi, E. J. (Eds.). (1993). The development of numerical competence: Animal and human models. Hillsdale, NJ: Erlbaum. Candland, D. K. (1995). Feral children and clever animals: Reflections on human nature. Oxford, UK: Oxford University Press. Cohen Kadosh, R., & Dowker, A. (Eds.). (2015). Oxford handbook of mathematical cognition. Oxford, UK: Oxford University Press. Coren, S., & Girgus, J. S. (1978). Seeing is deceiving: The psychology of visual illusions. Oxford, UK: Erlbaum. Delboeuf, F. J. (1865). Note sur certaines illusions d’optique: Essai d’une théorie psychophysique de la manière dont l’oeil apprécie les distances et les angles [Note on certain optical illusions: Essay on a psychophysical theory concerning the way in which the eye evaluates distances and angles]. Bulletins de l’Académie Royale des Sciences, Lettres et Beaux-arts de Belgique, 19, 195–216. Dewsbury, D. A. (2013). Comparative psychology in historical perspective. In D. K. Freedheim & I. B. Weiner (Eds. ), Handbook of psychology, Vol. 1: History of psychology (2nd ed., pp. 79–99). Hoboken, NJ: Wiley & Sons. Ebbinghaus, H. (1902). The principles of psychology: Vol. I. II. Leipzig, Germany: Viet. Friedman, D. (1998). Monty Hall’s three doors: Construction and deconstruction of a choice anomaly. The American Economic Review, 88, 933–946. Geary, D. C, Berch, D. B., & Mann Koepke, K. (Eds.). (2015). Evolutionary origins and early development of number processing. London, UK: Academic Press. Hastie, R., & Dawes, R. M. (2010). Rational choice in an uncertain world: The psychology of judgment and decision making. Thousand Oaks, CA: Sage. Honig, W. K., & Fetterman, J. G. (Eds.). (1992). Cognitive aspects of stimulus control. Hillsdale, NJ: Erlbaum. Hulse, S. H., Fowler, H., & Honig, W. K. (Eds.). (1978). Cognitive processes in animal behavior. Hillsdale, NJ: Erlbaum. Judge, P. G., & Essler, J. (2013). Capuchin monkeys exercise self-control by choosing token exchange over an immediate reward. International Journal of Comparative Psychology, 26, 256–266. Mischel, W. (1974). Processes in delay of gratification. In L. Berkowitz (Ed. ), Advances in experimental social psychology (pp. 249–292). New York, NY: Academic Press. Mischel, W. (1981). Objective and subjective rules for delay of gratification. In G. d’Y-dewalle & W. Lens (Eds. ), Cognition in human learning and motivation (pp. 33–58). Hillsdale, NJ: Erlbaum. Nelson, T. O. (Ed.). (1992). Metacognition: Core readings. Toronto, Canada: Allyn and Bacon. Pfungst, O. (1911). Clever Hans (The horse of Mr. von Osten): A contribution to experimental animal and human psychology. New York, NY: Henry Holt. Roitblat, H. L., Bever, T. G., & Terrace, H. S. (Eds.). (1984). Animal cognition. Hillsdale, NJ: Erlbaum. Selvin, S. (1971, February). A problem in probability. The American Statistician, 29, 67. Shettleworth, S. J. (2010). Cognition, evolution, and behavior, 2nd edition. New York, NY: Oxford University Press. Stevens, J. R., Rosati, A. G., Heilbronner, S. R., & Mühlhoff, N. (2011). Waiting for grapes: Expectancy and delayed gratification in bonobos. International Journal of Comparative Psychology, 24, 99–111. Tomasello, M., & Call, J. (1997). Primate cognition. New York, NY: Oxford University Press. Vonk, J., & Shackelford, T. K. (Eds.). (2012). Oxford handbook of comparative evolutionary psychology. Oxford, UK: Oxford University Press. Wansink, B. (2006). Mindless eating: Why we eat more than we think. New York, NY: Bantam Books. Zentall, T. R., & Wasserman, E. (Eds.). (2012). Oxford handbook of comparative cognition. Oxford, UK: Oxford University Press. 1 Or, in the case of the classic television game, you might “win” something like a goat rather than the sports car you presumably had hoped to win. I always wondered how many contestants who “won” the goat (and there were a lot!) actually wanted to take it home. I would have. I bet many of you would too, given how little we know about goat cognition (but see Baciadonna, McElligott, & Briefer, 2013; Briefer, Haque, Baciadonna, & McElligott, 2014; Nawroth, Brett, & McElligott, 2016; Nawroth, Prentice, & McElligott, 2016), and how nice it would be to have some help with the yard work.